For a few intensively monitored volcanoes, scientists in recent years have greatly improved their capability to predict when and sometimes even where an eruption might take place, with lead times on the order of several days or less. For example, the current ability to predict eruptive episodes at Mount St. Helens represents a major advance; since 1980, all episodes (except for one very small event in 1984) have been successfully predicted several days to 3 weeks in advance. Even for accurately predicted eruptions, however, there is no way to anticipate their size or duration. Moreover, scientists are not yet able to forecast accurately the long-term future behavior of volcanoes. For example, scientists cannot answer with any certainty the following questions about Mount St. Helens: Is the intermittent activity of the 1980s over? Will another large explosive eruption comparable to that of May 18, 1980, take place within the next decade or even century? Will lava flows accompany future eruptions? Most earth-science studies are concerned with past events, and the axiom that "the present is the key to the past" is fundamental to these studies. In recent years, as earth scientists have been asked repeatedly to look forward in time, the axiom that "the past and present are keys to the future" has become increasingly significant. Clues to the possible future behavior of Mount St. Helens are gleaned from its past eruptive history. During the past 50,000 years, Mount St. Helens has experienced nine "eruptive periods," not counting the activity of the 1980s. The term eruptive period is informally used by geoscientists for a segment of a volcano's eruptive history encompassing a series of eruptive episodes closely associated in time and/or type of eruptive processes or products; such periods are separated by dormant intervals, generally of longer duration. The most recent and best known of the pre-1980 eruptive periods began with a major explosive eruption in 1800 A.D. For the next 57 years, this event was followed by intermittent relatively small explosive eruptions, lava flows, and the extrusion of a lava dome. Assuming that Mount St. Helens behaves as it did in the 19th century, the present activity could continue intermittently for years, possibly decades. Such activity could include the outpouring of lava flows (not observed to date), as well as renewed dome growth and small-to-moderate explosive events. The chance of another catastrophic landslide and blast comparable to that of May 18, 1980, is exceedingly low. The past history of the volcano suggests, however, that one or more explosive eruptions with heavy ash fall comparable to that of the May 18, 1980, eruption might occur before Mount St. Helens returns to a dormant state. This history of intermittent activity is one of the most important reasons why scientists continue to monitor the volcano to detect the intensive, sustained seismic activity and ground deformation that can be expected to accompany any massive infusion of new magma required to break the pattern of dome building in the 1980s and to feed an explosive eruption of major proportions. View of Mount St. Helens from Johnston Ridge on March 30, 1987 (Photograph by Lyn Topinka); through April 1990, the composite dome inside the crater has not enlarged since the last eruptive period in October 1986. 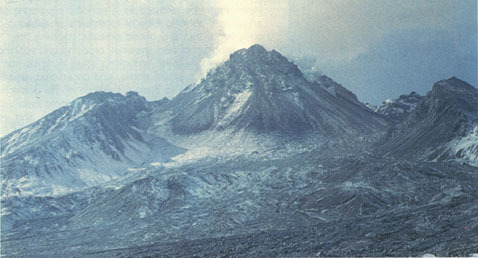 Bezymianny Volcano, Kamchatka, U.S.S.R., erupted violently in March 1956 and has been intermittently active since then. This photograph, taken in 1977, shows the growing composite dome of Bezymianny rising above the crater rim. 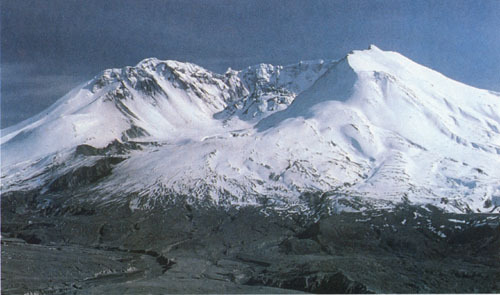 Mount St. Helens could similarly remain active for several decades, and continuing dome growth ultimately may fill the crater to form a new conical summit (Photograph courtesy of the Kamchatka Volcanological Station).